Everything in the “White Mans” World is centered upon Capitalism, whether in his Governance, Religion, Education, Economy, Medicare, Welfare, Media, Judicial, or Military, each institution is structured to benefit the Capitalist system which has only contributed to the destruction of the Earth and its Peoples. The White Man has infected us with Capitalism by disguising his institutions with our cultural symbols and placing them within our communities so he no longer has to kill us out in the open but rather we destroy ourselves internally. These institutions are the modern day Smallpox blankets in which we need to disrobe of as quickly as we can, replacing them with our own socio political institutions in order for us to remain as Anishinabe. The Indian Act, Reserves, Chief and Councils, Aboriginal Policing, Aboriginal Self-Government, Economic Development, Social Services, Aboriginal Child Welfare, etc. are painted to look like our own institutions which exploit our cultural symbols so we are fooled into believing that these things belong to us. Underneath they are still colonial and benefit only the “white man” for his capitalist agenda. When institutions, agreements, organizations are dressed up to look “Aboriginal” we tend to think we are gaining a little bit more authority back to govern ourselves but really it is just the Self Administration of our own Extermination. These things are still “white” even though you may see a thunderbird pasted on a police vehicle or a medicine wheel on an Aboriginal Children’s Aid organization. 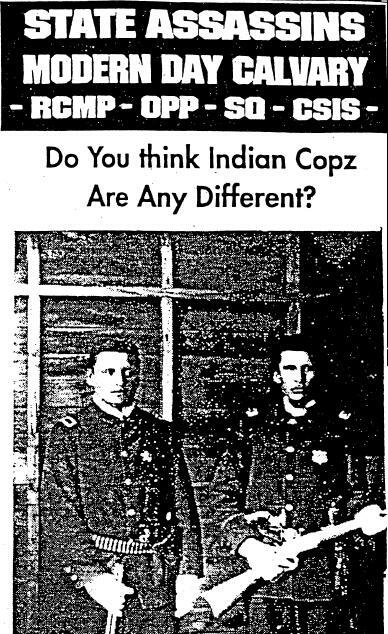 Red Tomahawk (left) was one of 43 men assigned to seize Sitting Bull, he took command and shot Sitting Bull in the back of the head. Question: Would it make sense to create our own beer and slap a logo of a sweatlodge on it and sell it to our people so only individuals and the government can profit? Why are we allowing the same thing to happen in other ways? First Nations: Everything enforced in the Indian Act is illegal including the elected Chief and Council system because it is in breach of the Canadian Constitution, Royal Proclamation, the Two Row Wampum, 1764 Niagra Covenant Chain Belt and the Treaties which acknowledge our title to our Lands and Rights including the Right to our own form of Self Government. 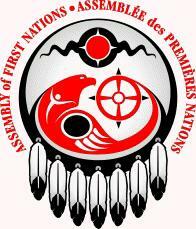 AFN/Chiefs/Union of Ontario Indians: These types of Chiefs organizations claim to represent their People however the leadership is elected only by Chiefs and they are funded by the Government. They want to embrace Capitalism over our own Traditional Indigenous Economic Systems so in turn they become hypocrites in advocating for our Culture, Rights, Treaties and Sovereignty. You can’t advocate for these things and then not put them to use for what they encompass and teach. They advocate and photo opt waiting on the Government to acknowledge our Sovereignty while real Sovereign Nations like the Six Nations Confederacy led by Clan Mothers, Hereditary Chiefs and Warrior Societies are taking action instead of waiting on the Government to do it for them. Anishinabek Police Service: These officers are enforcing Canadian Laws in our own Community which breaches our Right to be a Sovereign Nation with our own laws. Anishinabek Clan system is responsible for correcting inappropriate behaviors therefore there is no need for lawyers, judges, jails in which we become a product set up only to benefit the Capitalist system. Aboriginal Economic Development: First Nations are now collaborating with Mining, Gas, Oil, Mineral and Forestry Companies to extract resources on their Traditional Territories becoming sell-outs to the very foundation of what makes them “First Nations.” White man still controls these businesses. We have our own Anishinabe Economic systems based on common ownership and cooperative management of the means of production and allocation of resources which works in harmony with the Earth. Remember only after all the fish are gone then you will know you can’t eat money. We cannot remain as Anishinabe with Anishinabe principles and values if we embrace Capitalism. Either Capitalism will fail or being Anishinabe will fail. 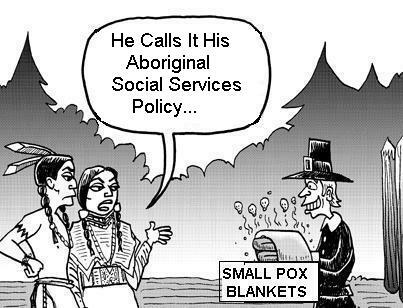 Aboriginal Social Services: Social Service Agreements that are administered by First Nations create dependency on the state, which is the institution that protects Capitalism. It is Capitalism that creates poverty conditions which requires our society to implement these Social Service Programs. It also diverts the working class and people living in poverty from uprising and replacing the Capitalist Society to a Socialist Society. Aboriginal Child Welfare: Some feel this institution is a modernization of Residential Schools. It removes Aboriginal children from their families, communities and cultures, and places them in mainstream society. Child welfare workers removed Aboriginal children from their families and communities because they feel the best homes for the children are not Aboriginal homes. Aboriginal Self Government: Portrayed as some form of sovereignty & nationhood, self-government is the exact opposite. It transforms band councils into municipal governments under provincial & federal control. Reserve lands become fee simple property that can be bought & sold on the free market. It’s the same goal as the 1876 Indian Act and the 1969 White Paper: the legal, political & economic assimilation of Indigenous peoples into Canada. Some bands are already well advanced in their self-government deals, including the Nisga’a, Sechelt, Westbank, Nunavut, James Bay Cree & Inuit, as well as the Gwich’in & other Yukon bands. In this way, self-government will really be the self-administration of our own oppression. Aboriginal Healing and Wellness Strategy: Healing Centers, Councilors and Social Workers and the work they do are based on Indigenous Culture which helps to “heal” individuals. This is very much needed but once a person becomes “healed” they go back into their impoverished communities and continue destructive behaviors as a result of social conditions which stem from capitalism. 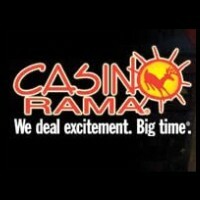 The Funding of this strategy is administered and depended on by Government sources. Social workers make a living off of “Aboriginal Misery” and the core issues are not being “healed” which makes our people again a product for the Capitalist system. With our expectation of receiving our Rights and Sovereignty and Land Claim Settlements from the Government and the dependency we have on Colonial Capitalist Institutions enforced under the Indian Act we have become extremely passive and disillusioned to get these things back for ourselves. Just because we are “Aboriginal” we expect these services and for the Government to respect our Nation to Nation agreements. The Government will never relinquish these things and they have made sure of that because they have made us to comfortable to fight for what is ours. That time is now over. We have our own Clan Governance system that can replace these Institutions. However if our people truly want our Sovereignty then it requires the individual to become responsible for participating in our own Anishinabe Governance. The time of depending on Cops, Welfare, Chief and Council etc is done, we need to organize immediately and dismantle these institutions replacing them with Anishinabe Institutions. Those who choose other wise can assimilate into Canadian Society and give the last bit of Anishinabe they have left to the White man which is their Brown skin and clear the way for the rest of us who choose to be who we really are. The time of being Hypocrites is over it is now time to walk our talk. Some of us are the incarnate of our ancestors and we are rising up to expose these frauds and replace them with Truth.